An emissary of the Emperor received His Imperial Majesty’s order to check the cherry trees in Arashiyama, located west of the city of Kyoto. These trees had been transplanted from Yoshino in Yamato Province to Arashiyama. When the emissary in charge of the imperial mission arrives in Arashiyama, he finds the cherry trees beautiful and in full bloom. He meets an elderly couple who takes care of the cherry trees. 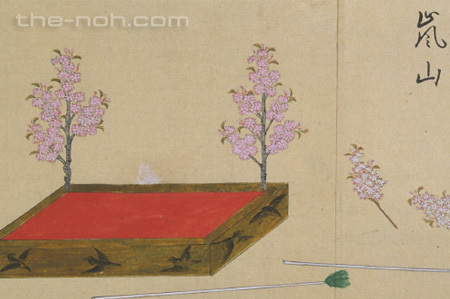 The couple purifies the ground under the trees and bow deferentially before the cherry blossoms. Observing their incomprehensible acts, the imperial emissary asks why they do that. The couple answers that they worship the cherry trees because the trees in the mountains in Yoshino are sacred, so these transplanted trees in Arashiyama are sacred as well. Furthermore, they mention that the Deity of Komori and the Deity of Katsute from Yoshino sometimes visit Arashiyama. Their divine power protects the blossoms from the wind and makes the cherry blossoms bloom exquisitely even in the harsh environment of Arashiyama (meaning “Stormy Mountain”). Then the couple reveals that they are actually the Deities of Komori and Katsute. The two gods tell the emissary to wait until night falls, and they ride away on a cloud towards the south from the mountain in the west. When night falls, the Deities of Komori and Katsute appear in front of the emissary and dance. When he has been thrust into the dance, a gust of fragrant wind blows from the south, an auspicious trail of clouds appears, and in the fullness of golden light, The Deity of Zaō Gongen* reveals his muscular self. The Deity of Zaō Gongen shows his vow that he communicates with all creatures, saves them from sufferings, dismisses evils, and protects the land of His Imperial Majesty. He also indicates that he and the Deities of Komori and Katsute consist of a holy trinity; they are just called by different names. Then the deities climb Mount Arashiyama, play with the cherry blossoms, fly over the trees, and bless the shining beauty at the peak of the spring. *Zaō Gongen: The main deity enshrined and worshipped in Kimpusen Temple in Yoshino. Zaō Gongen is unique to Japanese Buddhism. The name “Arashiyama” contains the word “arashi,” which means a storm that is strong enough to blow flowers off trees. But unlike its rough name, this Noh piece describes an earnest wish and a prayer for the peaceful and beautiful world, which lasts without being beaten down by the “storm,” i.e., many evils and difficulties in this world. 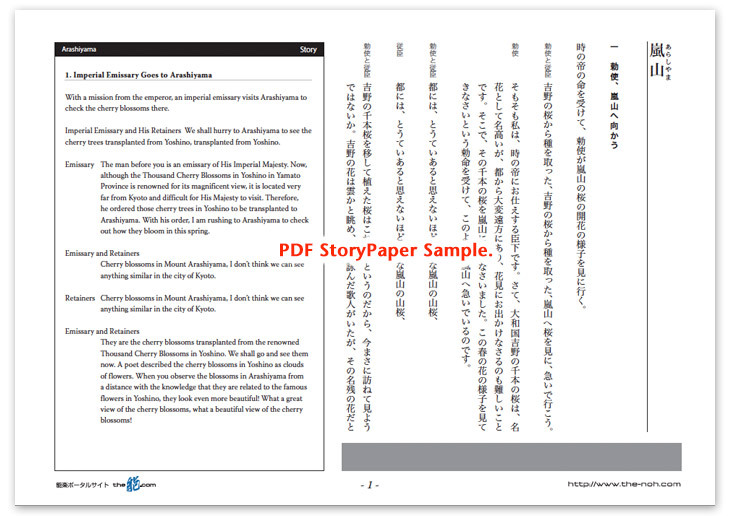 Just like other Waki-Noh pieces, the story is quite simple. But audience of this drama will thoroughly enjoy the world of cherry blossoms, which develops godly, purely, and beautifully in front of their eyes. A kyōgen performed during the intermission sometimes includes a special staging feature, called “Saru-muko”. In this performance, a number of kyōgen-kata who dress like monkeys appear on stage and perform the happy wedding banquet scene where a male monkey in Yoshino marries a female monkey in Arashiyama. Except for some parts, most of the conversation is made by “monkey-language,” i.e., onomatopoetic words such as “kyakyakya” or “kyaa, kyaa.” This is very fun and unique must-see performance. Although this is a part of “Arashiyama”, Kyōgen lovers sometimes perform this “Saru-muko” part alone.